Earlier this month, Donate Life Texas was proud to announce it’s partnership with NASCAR driver Joey Gase for the November 2015 race weekend at Texas Motor Speedway. Since then, so many exciting plans have been developing that will allow race fans to meet Joey and see both the Donate Life Texas #52 XFinity Series car and the ZAK Products Sprint Cup Series car he will be racing. Check here to find the appearance nearest you! Watch as we unveil this car decked out in full DLT style in a special recognition of the support of the Texas Department of Public Safety at their brand new South Dallas Driver License Mega Center! If you made a donation have an honoree’s name or photo on Joey’s car, this is the appearance for you! What: Meet Joey, take pictures with the Donate Life Texas #52 car and even get an autograph! Haven’t joined the donor registry yet – you can sign up to save lives right on the spot! ZAK Products and Grapevine Ford Lincoln are honoring Joey’s deep commitment to Donate Life by hosting a special appearance and donor registration drive at the dealership. Come check out the ZAK Products #32 Sprint Cup Car complete with a donor photo tribute with a local tie. Click here for a flier! What: Enjoy refreshments, meet Joey and take pics with the ZAK Products #32 Sprint Cup car! 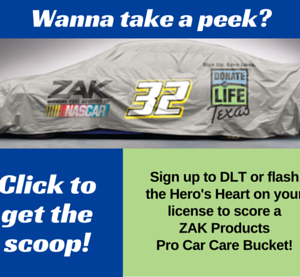 The first 50 people to join the donor registry or show the Hero’s Heart donor symbol on their drivers license will receive a complimentary Car Car Bucket filled with ZAK’s Professional Grade Goodies. Come meet Joey at the Donate Life Texas Tent in the TMS Midway / Fan Engagement Zone. You can sign up or flash the Hero’s Heart on your license to snag some sweet swag! If you can’t make it when the Real Joey is there, you can snap a selfie with Flat Joey to show others your commitment to Donate Life! What: Meet Joey, score an autograph & sign up to save lives, all in one place!